To gauge the true lightweighting potential of a material we must look at specific strength (strength per unit volume) and specific strength per dollar as the metrics to compare material. Comparisons of specific strength are far more accurate, particularly when comparing ultra-high strength materials, and by this metric DM steels stand above the competition. Detroit Materials steel offers the high performance advantages of exotic-alloy steels (1300MPa UTS, 16% Elongation) with the ability to cast thin wall section (3mm wall) and complex geometries at comparable cost and performance as ADI and GJS ductile iron parts. Detroit Materials can develop custom grades for your specific application. Our MATERIALS ON DEMAND® approach combines the fundamentals of Integrated Computational Materials Engineering with our property databases, and complex simulation models. 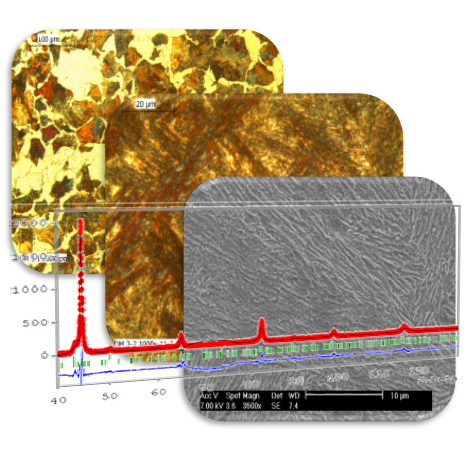 This methodology has proven successful in the development of of ultra-high performance perlitic and bainitic steels. We can re-engineer our steels to combine specific properties, such as hardness and toughness, or strength and toughness, to optimize your application. DM Ferrous materials are nano-structured castable steels available for demanding applications. DM steel offers the performance advantages of an exotic-alloy steel with the ability to cast thin wall section and complex geometries. Castable from 3mm to 25mm wall thickness.